After a well earned holiday from the whirlwind of Dinner at the Manor, we are refreshed, relaxed and BACK! Our Jamie Does... event is coming in just over a couple of weeks’ time and we want to share some gems with our guests from this book. Have a look at the menu – what do you think? Also, we’ll be announcing our Autumn / Winter dates this weekend, so please keep your eyes peeled if you want to grab a space! 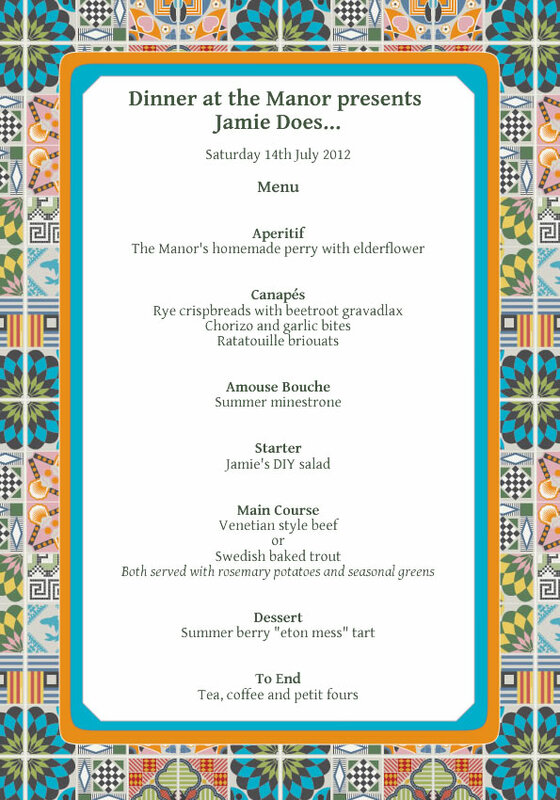 This entry was posted in Menus, Upcoming Events and tagged 2012 Dates, Dinner at the Manor, Jamie Oliver, Supper Club, Underground Dining, Underground Restaurant, Yorkshire on June 28, 2012 by Susie Barker.